Conservatives launch a new assault on trade unions by banning public sector bodies from automatically deducting subscription fees from workers' wages. Nurses, teachers and civil servants are to be barred from automatically paying trade union subscriptions from their wages, the Government has announced. In a fresh assault on the unions, ministers will abolish the practice under which nearly four million public sector workers have their fees taken directly from their pay every month. Minister say that in the 21st century the approach is "outdated" amid concerns that it leaves the taxpayer with a £6.5million bill every year to help fund union payments. Workers will instead have to arrange to make the payments themselves, a move which is likely to lead to a significant decline in funding for Britain's biggest trade unions. The plans will also have an impact on the funding of the Labour Party, which depends on the unions for millions of pounds in donations every year. It comes as commuters in London face travel misery today after a strike closed the underground system for the second time in a month in a dispute over plans to bring in a night service. Later this month unions will also bring chaos to the national rail network with two separate strikes - one of which is scheduled for the Bank Holiday weekend. 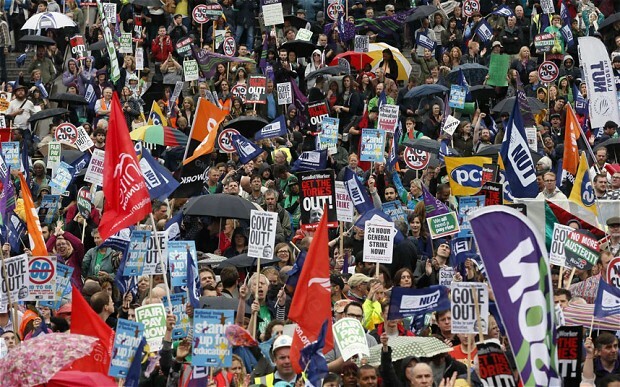 Today's announcement forms part of the biggest shake up of Britain's trade union laws for a generation, which will see a significant squeeze on funding and bar unions from holding strikes on the basis of votes which are years out of date. Matthew Hancock, the minister for the Cabinet Office, said: "In the 21st century era of direct debits and digital payments, public resources should not be used to support the collection of trade union subscriptions. "It’s time to get rid of this outdated practice and modernise the relationship between trade unions and their members. By ending check off we are bringing greater transparency to employees - making it easier for them to choose whether or not to pay subscriptions and which union to join." 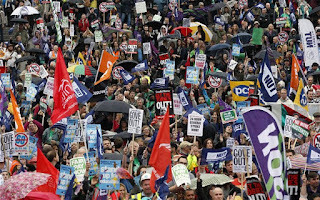 The new Tory plans will lead to further clashes with the unions, which have already threatened illegal "wildcat" industrial action over anti-strike laws. The Conservatives attempted to scrap automatic payments to unions from civil servant's wages under the Coalition government but were blocked by the Liberal Democrats. So far only the Home Office, HMRC and the Ministry of Defence have successfully abolished the practice. The new plans go significantly further, extending the ban to all public sector organisations including councils, NHS Trusts, police forces, fire services and quangos. The move could lead to the end of automatic payments for up to 3.8million workers, potentially costing the trade unions tens of millions of pounds in funding a year. Ministers say the practice is outdated because it was introduced at a time when many people didn't have bank accounts and before direct debits or digital payments existed. They believe that the reforms will benefit union members by giving them "greater control over their subscription" and protection under direct debit guarantees. Conservative sources said that diverting the payments to the unions costs taxpayers the equivalent of £6.2million a year. In separate measures already announced by ministers union members have to opt in to paying a "political levy" to the Labour Party, rather than opting out as at present. The government has already said it wants to ban industrial action in key sectors unless 40 per cent of workers vote in favour. It will also require turnout to reach at least 50 per cent of those entitled to vote for a strike to go ahead, and lift a ban on employers using agency workers to help plug the gaps. The legislation will stop unions from holding strikes on the basis of historic votes that were supported by just a fraction of the workforce. The government will also consult on a new criminal charge to stop those who are on strike from intimidating employers and colleagues who choose not to take part in industrial action. Jonathan Isaby, Chief Executive of the TaxPayers’ Alliance, said: “This announcement is long overdue. It is simply not the business of public sector employers to be processing the union dues of their staff, and it is shocking how many bodies have been providing this service at absolutely no cost to the unions who are benefiting.